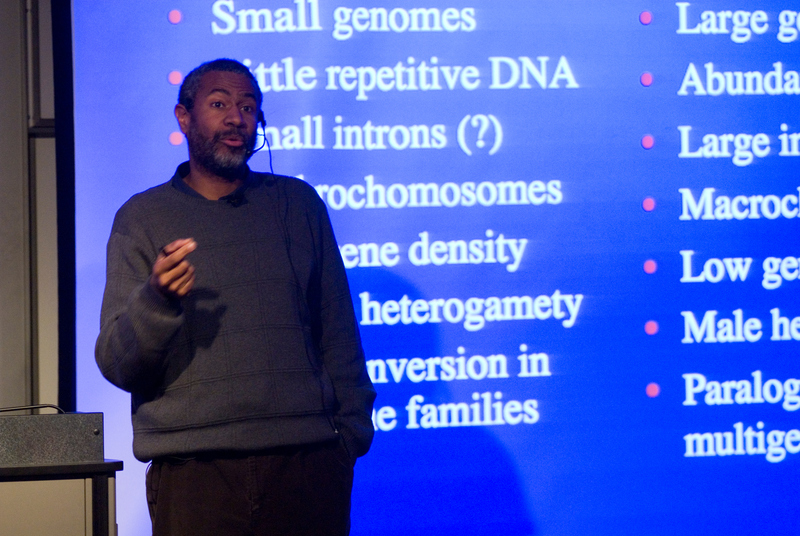 A Harvard University professor discussed genomics as the first speaker of Indiana State University's biology department's seminar series. Scott Edwards, professor of organismic and evolutionary biology and curator of ornithology in Harvard University's Museum of Comparative Zoology, served as the Diversity in Science speaker on Tuesday (Jan. 13). The diversity speaker honors minority researchers and gives students' role models, said Rusty Gonser, ISU assistant professor of biology. "It honors the work done by under-represented groups who have made contributions to science," Gonser said. 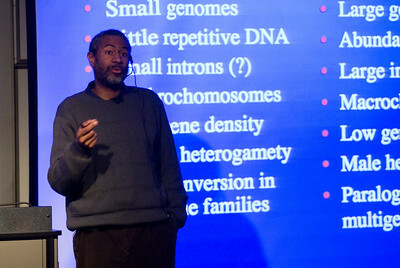 Edwards spoke to students and faculty gathered in the Science Building about "Using Genomics to Study Evolution, Biodiversity and Diseases in the Wild." "It's a very exciting time these days as biologists try to take advantage of genomics out there and apply it to our favorite system," he said. "I was turned on to bird watching at an early age." Genomics is the study of all the genes contained in a cell. He combined his interest in birds with his interest in science and now focuses his research on the principles of molecular evolution and the evolution of genes involved with disease resistance in wild birds. During his talk, Edwards spoke about genome evolution in reptiles and how studying dinosaur genomics has led to understanding of how avian genomics have become streamlined. He also touched on mining DNA from museum specimens so biologists can interpret biodiversity, as well as using genomics to understand the spread of diseases. "We live in a time of exciting, bold projects in genomics," he said. While birds have small genomes, or the hereditary information found in DNA, mammals have large genomes. Yet, Edwards said research has shown that the origin of small genomes is not coincident with the origin of flight. "Mechanistically, birds seem to have jettisoned huge amounts of their DNA," he said. Research is continuing on how and why that occurred. The series' next two speakers will take on forensics. Richard Li with the John Jay College of Criminal Justice of the City University of New York plans to speak on forensic biology on Jan. 20, while the following week Roland Kohr, Vigo County coroner, plans to give his "Top 10 reasons I Hate CSI" on Jan. 27. The talks begin at 4 p.m. in Science Building Room 12. The series, sponsored by the ISU department of biology and St. Mary-of-the-Woods College science and math department, brings internationally recognized research scientists to speak to students and community members. For more information, visit www.indstate.edu/darwin/or call 812-237-2501.